They save the pool owner money. The idea is simple and to the point; however, one question remains, “Does this new direction come at a cost?” The answer is yes, as low-flow settings, in some ways, compromise the desired performance level of variable- and two-speed pumps because many secondary pool components that work hand-in-hand with these systems were designed for use with single-speed pumps. To prevent the performance level of variable- and two-speed pumps from being compromised, it is important to understand the benefits of low-flow rates first. Low-flow rates not only reduce energy costs as pumps run at lower speeds, but filtering and heating efficiencies also increase. Rather than having a high volume of water pass through the pool filter under great pressure, which can lead to contaminants being forced through the filter media, lower flow rates allow the filter to be more efficient at ‘catching’ these contaminants. This also improves the cleanliness of the pool water, which reduces chemical usage and associated water maintenance expenses. These benefits can also be applied to pool heater efficiency. The longer a volume of water spends in a given pool heater (whether gas, electric, solar, or heat pump), the longer the heater has to transfer heat energy to the water. As a result, the pool owner saves money by reducing heating costs. Therefore, if the goal is to operate an efficient swimming pool by keeping it clean and reducing costs in the process, then low-speed pump settings are the answer. One challenge that has made it difficult for some business owners and service providers to offer their clients this newer pump technology is the simple fact most swimming pool components were not designed around this low-flow or variable-flow concept. In fact, most system components on the market today were created for single-speed pumps, which blast large volumes of water at a constant high-flow rate for short operation cycles, rather than using a low-flow rate for much longer operational periods. Therefore, when a pool owner switches from an inefficient pump to a variable- or two-speed pump, compromises have to be made to the overall pool system. For example, the pool’s plumbing system will see a noticeable drop in efficiency in its ability to effectively agitate and skim the water surface, in addition to a lack of ideal circulation. One way to resolve these issues is through the pool’s return units. Pool returns play an important role in water circulation and are a major component in providing proper agitation, circulation, and skimming action. 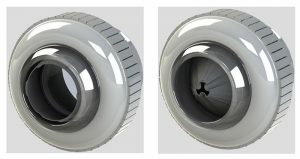 Proper pool return (orifice) size is therefore integral to an efficient circulation system when operating a pool at low-flow rates. Using the wrong pool return, in terms of its size, can create excessive back pressure on the pool’s plumbing system. This back pressure, which is calculated as part of the pump’s total dynamic head (TDH), can cause unwanted stress on the system, leading to higher energy consumption as well as decreasing the lifespan of other pool components and equipment. For example, in terms of pump motors, the more stress placed on the motor, the more work it has to do, which in turn increases the chance of it failing early on in its life cycle. One common problem is the increase of wear of the motor’s bearings. This is easily detected by an increase in noise from the motor until complete failure. Another problem that is often unnoticed is over agitation. This can lead to increased rates of evaporation, which in turn results in greater heat loss. This causes longer heating times, which further translates into increased heating costs for the pool owner. Over agitation also reduces the effectiveness of providing the proper flow required to push debris into the pool’s skimmer pots. This increases the chance of debris sinking to the pool floor; the more debris that sinks to the bottom of the pool increases the amount of chemicals required to prevent algae growth, as well as the amount of time spent on pool maintenance. One way of skirting around this issue is to set the pump to operate at a low-flow rate (to save money) and install smaller orifice returns, in correlation to the flow rate, to enhance pump performance (i.e. agitation/circulation). However, as stated earlier, certain components require higher flow rates to operate properly (e.g. heaters, chlorine generators, etc.). Therefore, in this scenario, one could keep the flow low, but when this equipment needs to be operated, the flow needs to be increased, which will then lead to over agitation as well as increased back pressure and energy usage. On the opposite end of the scale, if larger orifice returns are installed, for the purpose of minimizing back pressure, TDH, and over agitation within the system, these returns become inadequate when it comes to efficient agitation and circulation as the majority of the time the pump will be operating at a lower flow rate. The pool owner could increase the pump’s speed or flow rate; however, it does not allow them to take advantage of the energy efficiency benefits nor the advertised cost savings associated with these pumps. An unlikely scenario would see the pool owner swap out the returns (e.g. a smaller return for low-filtering cycles and larger returns for heating cycles) whenever the situation demands it. It would not take long, however, for the pool owner to realize this exercise rarely happens due to the mere inconvenience of manually changing the pool returns. Therefore, the ideal way to resolve most of the issues is to use a variable orifice pool return that is capable of self-adjusting its opening based on changing flow rates. These returns provide a balance between efficiency and the desired performance the end user expects from their pool pump. A swimming pool equipped with variable orifice pool returns enables the pool owner to maximize return flow velocity (i.e. agitation/circulation) at low-flow settings, while minimizing back pressure and TDH issues when running the pump at high-flow settings. When comparing the three most common pool return sizes (9.5, 19, and 25 mm [3/8, 3/4, and 1 in.]) 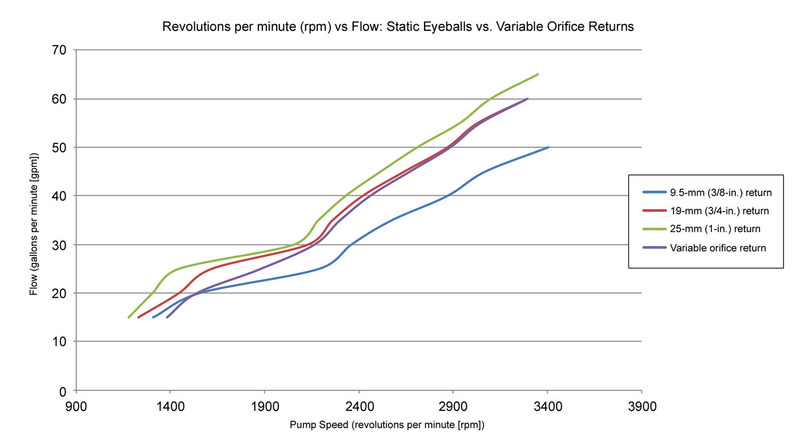 to a variable orifice return, no matter what size eyeball is used, the lower the pump’s flow rate, the more energy-efficient the pump becomes (see Figure 1). 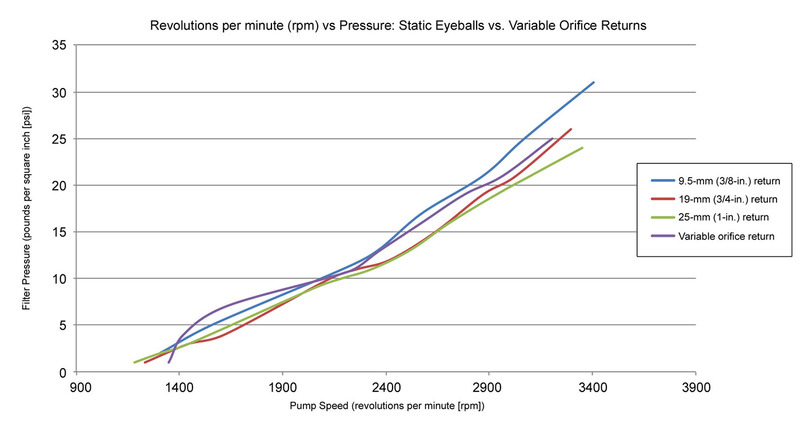 As stated previously, this is also when filtering and heating are most efficient. From 57 to 76 litres per minute (lpm) (15 to 20 gallons per minute [gpm]), there is little difference in energy usage from any given pool return. Where the difference lies, however, is in the agitation and circulation provided by each pool return. The smaller the orifice, the better the agitation and circulation. However, when using a standard 9.5-mm (3/8-in.) pool return, in conjunction with a variable-speed pump, any change in flow rate above 76 lpm (20 gpm) reduces efficiency. 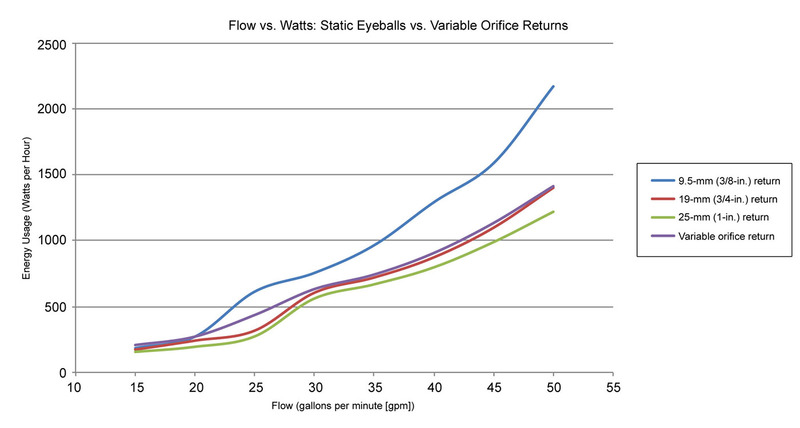 By using a variable orifice pool return, the orifice becomes larger as the flow increases. This adaptation enables the pool return to provide ideal agitation and circulation at lower flow rates, while also instantly adapting to higher flow rates to remain efficient when demand requires an increase in flow. In terms of rpm versus pressure (see Figure 2), research shows as the pump speed/flow rate increases, so does the pressure on the system. This increase in pressure can result in the reduction in the life expectancy of the filtration system. The added pressure, and restriction it creates, is directly related to the size of the pool return. The smaller it is, the greater the restriction as flow increases. Further, this restriction also demands higher speeds (rpm) from the pump for a given flow when compared to a larger pool return. Typically, a pump will operate at low-flow/low-speed (rpm) for the majority of its life. However, when there is a need for the system to increase its flow/speed (rpm) (e.g. during a heating cycle), and a variable orifice pool return is installed, it will open, based on the flow rate, and reduce unwanted restriction on the system. This also allows for greater flow at lower pump speeds. Further, overall stress on the system is reduced and less equipment failures are likely to occur. For example, at a flow rate of 151 lpm (40 gpm), the water pressure through a 9.5-mm (3/8-in.) pool return is 0.15 MPa (22 pounds per square inch [psi]), while the water pressure through a variable orifice return would be 0.10 MPa (13 psi). When looking at rpm versus flow (see Figure 3), research shows as the flow/speed (rpm) of the system increases, the less efficient a smaller pool return becomes at providing a given flow. The smaller the orifice, the greater the restriction and the harder the pump needs to work. On the other hand, a variable orifice return will self-adjust, allowing the system to operate more efficiently (use less energy) when obtaining a given flow rate at a lower speed (rpm). This article was written by Sean Walsh & Zach Schulz and originally appeared on Pool & Spa Marketing [link].